He was our first baby. The baby who we cut our teeth on, preparing us for the two babies to come. He made Marley look like an angel. I remember crying for three straight months, afraid of what I’d come home to after work. A half-eaten wall, an ingested blue ball-point pen, dripping down from his stained tongue, down the front of his white fur, down to his huge puppy paws. The stick of butter on the counter that was gone in 2 seconds flat when I turned my back. Dragging me down, again, on the sidewalk as I teetered on my heels, walking him before work, pantyhose ripped, blood dripping down my knee. My eyes welling up as Paul looked at me in horror. Damn dog. Crazy puppy. Having a puppy, then adolescent lab (or any dog) is hard. At least Jackson was – he was that one puppy in the litter that looked you in the eye, straight, with a smirk, and grabbed the hose in the garage and dragged it around, even though he was only 10 weeks old. “He’s the smart one,” the breeder said. “A little more work, but you won’t regret it.” Hmmmm. That was such a huge clue. But we were in our 20′s, and smart sounded good to us. I remembered Paul giving him his first bath in our little sink in SF. He was shaking and scared and looked so innocent. This wasn’t going to be so hard. How could it be? “Don’t worry, he’ll calm down when he’s 2,” fellow dog owners would say at the park. And then, when he was two, “Oh don’t worry, when he’s four, he’ll be really mellow.” Not so. Although he was impossible to train, and 85 pounds, he was becoming part of our family, and we were all adapting. It wasn’t until he was about 6 years old that he started to take some deep breaths and sit still for awhile. Still, that was after a long swim in the ocean, beneath the Golden Gate bridge, where we’d chuck a half-empty water bottle as far as we could, and he’d swim way out to retrieve it, about 20 times in a row. His nirvana. Then, after a year of trying, I finally got pregnant. Or so I thought. As fast as I saw two lines on that stick, it faded back to one, in a matter of days. I did not leave our sofa for three straight days. And neither did Jackson. Paul had to pull him off the couch to go pee, and then he’d hop right back up, snuggled into my stomach. Then finally, bringing home our first baby Sam, Jackson took on a more mature role, as protector. Even the UPS guy was fearful of putting an Amazon package on the doorstep. Paul, who traveled around the globe at that time, would come home, drop his bags and dive into Jackson on the floor for full-body hugs. We’d finally clear our throats – “Helloooo, we’ve been here too, for about a week. Paul?” They were best friends. And Jackson somehow knew before we did when Paul was about to pull up — he’d pace the hallway and start whimpering. 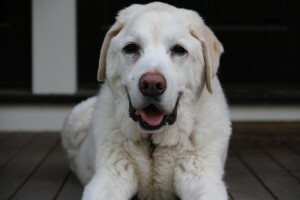 We knew Jack was slowing down after he turned 12 — his back legs started moving a little slower up and down the stairs, and he started having a harder time getting up off the hard wood floors. Nothing atypical – and his bloodwork and hip x-rays all looked stellar. His father Cassidy lived till 15 or 16, so we were confident that we had lots of time. We said goodbye to Jackson in our home, on a beautiful sunny day. We took so many pictures and videos in that last five days, when we knew. One of my greatest memories will always be watching Paul give Jack his last bath, outside on the deck, so tenderly, as tears fell from his face. He wanted his boy to be clean, and Jack seemed thankful. And then, the startling silence. The unending silence. It’s been 4 weeks today, and the house still seems eerie. I walked down the stairs yesterday in flip flops and when I arrived in the kitchen, Emily looked at me and burst into tears. I sounded like Jackson’s paws, and for a second she thought he was right there. It’s amazing how tough it is to talk to people about this part. The part that tears your guts from your body. He was so much more than a dog, than a pet. He was our first baby. Some people really get it and I am truly grateful. Thanks for everything, Jax. Love you always. Oh, I’m so sorry for your loss. I DO get it…I say as tears stream down my face. I dread that day when our two training babies, as I called them when we got each, are no longer with us. One is 8, the other 6. Both getting a bit grayer all the time. The 8 year old sleeping much more during the day. I pray you’ll get through this time, with each day getting easier. you’ll never have him out of your heart, but I pray the pain of him being gone lessens. I am in tears reading this and thinking about our sweet boy. So beautifully written. I get it. We said goodbye to our first baby nearly 3 years ago. We just welcomed a new puppy into our lives. With each stage he passes into we remember our first baby with a smile or a laugh. She will always be in our hearts. This is a beautifully written piece. I have tears streaming down my cheeks. What an incredible bond. Our cat Kuhio, age somewhere between 18 and 20, left us in June, kind of the same way Jax left you. I love your story, and yes, they live on in our hearts always!